The immediate feedback to Dr. Laura's seventh bestseller, The Proper Care & Feeding of Husbands , affirmed that Dr. Laura helped hundreds of thousands of readers make good marriages even better and saved many from the brink of divorce. 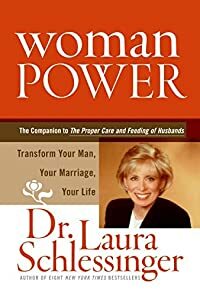 Now, due to overwhelming response from her readers and listeners who wanted to know more about the special power women have to transform their husbands, their marriages, and their lives, Dr. Laura has written Woman Power . Through a series of provocative chapters and Q&As, Dr. Laura guides women on how to assess what is valuable and what is vulnerable in their marriages, and stimulates women to think about what is really important about being a woman, a wife, and a mother. In addition, readers will find inspirational stories and tips, thought-provoking essays, and plenty of room for entries, thoughts, and journals. There are even fascinating Q&As for husbands and wives to do together! Woman Power is the perfect companion book for the woman who wants to ensure herself -- and her man! -- the marital happiness and satisfaction everyone dreams of.